Nectar Group offers dry bulk handling services throughout the world, from quayside bagging services and bulk discharge services using grabs - to equipment hire and pneumatic discharge services. In the early 1980s, Nectar revolutionised the bulk commodities handling industry at developing ports around the world when it designed and launched the world’s first quayside bagging services. Nectar Group have a variety of clients, from producers and traders to ship owners, agents and end receivers. They are able to work with a variety of free-flowing commodities such as fertilizers, rice, wheat and other grains, peas and sugar. With all the different kinds of products they handle, there are many challenges. Some products are granular and easy to handle, while some are in powder or flake form. Some products are free flowing and dry, while others are extremely hygroscopic. Add to that the challenges of handling these cargoes at numerous worldwide ports in varying weather conditions – from extremely dry to extremely humid! One area of Nectar’s concern has been the handling of fertilisers like NPK, CAN and MOP, which have a high Nitrogen/Ammonia and Chlorine content. 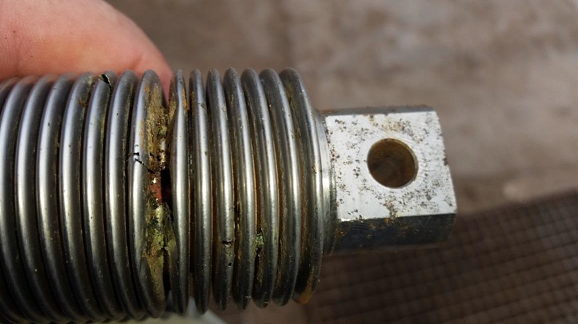 These products are highly corrosive; standard stainless steel load cells from various major load cell manufacturers became corroded very quickly when saturated with a variety of different fertilisers. Added to this, in Bulk Cargo Weighing and Dosing the weighing rate is very high - typically 10 000 weighments per bunker, per day. High cycle loading + corrosive products + tropical climates lead to early failure through a combination of fatigue accelerated by chemical stress corrosion cracking, as the picture below illustrates. Following discussions with Thames Side Sensors, it was suggested that Nectar make a trial with Thames Side's Parylene coated load cells at a fertilizer plant in Venezuela, where they handle particularly unpleasant products in a hot, damp and corrosive environment. The special transparent Parylene (the generic name for poly-para-xylylenes) coating is formed from linear, highly crystalline polymers that are both chemically and biologically inert and stable, and therefore make excellent barrier materials. Parylenes are almost completely unaffected by solvents, have low bulk permeability and easily pass a 100 hour salt-spray test. They also have good thermal endurance and can perform in air without significant loss of physical properties for 10 years at 80 degrees Centigrade. Coating thicknesses on load cells are typically 15-18 microns and are pinhole-free. The trial was extremely successful – the coated load cells have now been in use for at least 2 years and have not suffered from any corrosion - whereas standard load cells from several major manufacturers at the same plant had lasted only a few months, and occasionally only weeks, before failure. Ultimately, The Nectar Group have derived many direct and indirect commercial benefits with the use of Thames Side's Parylene coated load cells and now specify them for all their applications. Their team can concentrate on the job in hand rather than trying to make the system work! Many other customers have also benefited from utilising Thames Side's Parylene coated load cells in such diverse applications as chemical and pharmaceutical plants, tanneries, laundries and even on scales in the Hong Kong Sealife Park, where they are used for weighing elephant seals and other marine mammals! All of Thames Side Sensors’ stainless steel load cells with total hermetic sealing and IP68/IP69K protection can be supplied with Parylene coating as an option, and the small additional cost is easily offset by their much extended longevity and a rapid payback. Request a quotation for Parylene coated load cells, or to find out if Parylene will be suitable for your application. A full PDF copy of the press release can be downloaded from here.